The Media Lab at IICP facilitates exploration of media forms – writing, audiovisual, painting, animation. As a space it honors the openness, uncertainty and tenuousness of creative practice. The July 2018 workshop on self-expression included sixteen adults living with cerebral palsy, with varying degrees of physical and intellectual disability. Some were severely hearing impaired. Most were Bengali or Hindi speakers who knew no English. Its visual language, its framing of fragility, was unfamiliar. The participants had not experienced anything like it before. Watching films was a rare experience for them. Holding attention, concentrating was painful. Translation – the act of making meaning travel; from one language to another, from one set of realities to another. Translation is at the heart of this media lab. Instead of being an impediment to experience, it exists with ease, aware of its own boundaries and willing to exceed them. Translation becomes an act of imagination here. Words are emptied of meaning, attached to another life, a different set of relationships and associations. We had insisted on a space that was free of judgement for the duration of the workshop. We wanted to explore the words and worlds of “Me”, “You” and the relationship between the two. We wrote about the two words and we made a list that we could combine in any way we wanted. We asked each other about each other. What are the questions you would like to be asked? How would you like to be known? My notes: Everyone has asked, What do you do when you are angry? How do you deal with difficult situations? What makes you go into silence? What do you do with silence? Could it be transformed into a generative state? What is a generative state? My notes: Where do we find the energy we need to go on, from day to day? The film was introduced in Bengali – the world “fragile” translated literally as “bhongur”, that which can easily break. The word wasn’t intuitive in this space, I discovered later. There was a palpable disconnect between understanding the breakability of thin ice or glass, and grasping the lived experience of fragility that was being summoned. Lata had said she would tell audiences: Watch this film with your body. She said she didn’t really understand what this might do to the watching. (Perhaps a shift in the sensory experience of it?) I passed on this instruction. There was silence in the room. To me, the entire workshop had encompassed the body and its primacy. Body and “media practice” – body that doesn’t necessarily obey / body and mobility / body and time. Things had to be reconstituted, rearticulated and reimagined. “Media” and “practice” had to be set free. When the film started I watched them watching or trying to. Some were strapped into their wheelchairs, some were trying to keep their heads steady to watch in one direction, some had to keep their hands and legs from flailing around at the slightest movement. Some were still, not moving at all. The images on the screen started filling the room. The ocean, dancing city lights from a car, a leaf quivering in a storm, a spiderweb. I listened newly to the hauntingly beautiful sound of the trombone. I took in the wisdom of fireflies. ‘We incapacitate ourselves by resisting nature’… ‘cleaving to one way of being’ ... I watched through the eyes of the whole room. A man struggled to take off his wet, white coat at the edge of the ocean. The camera followed his performance. “The coat is sin. He is freeing himself from it,” Chandan said in the break. My notes: I am not sure how this is being seen. This film is so much about the body, but the body that has been signified, been given meaning, been identified as fragile, that has suffered and been imprisoned. I am surrounded by such bodies in this room. I understand nothing of the ways in which this film is being watched or experienced or felt. I don’t know attention spans, or time. In fact, I know nothing about time in this space. We divided the watching into two parts. We didn’t respond immediately. In the second part, the room felt tangibly less tense. The flow of the film had been entered into. Each image was unto itself. Is this being experienced in waves? In layers? Or indeed like a kaleidoscope? Shradhha said, “I feel a bit sad”. Putul laughed, and made a gesture of holding something close to her heart. She said it was what the film made her feel. Dipak said he had watched the film very carefully. Priya Sen is a filmmaker and artist working across film, video, sound, and installation. Her work has largely centered around questions of form, urban ethnographies, music, and migration. 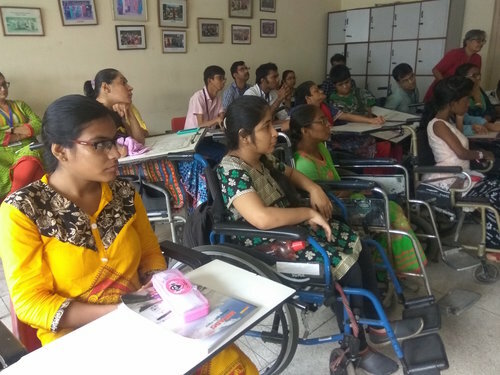 She initiated the Media Lab at the Indian Institute of Cerebral Palsy, Kolkata, in 2015. She lives and works in New Delhi.